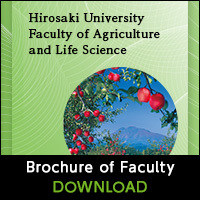 The Faculty provides a platform for students’ transformation into able professionals who demonstrate fundamental and specialized knowledge in the fields of agriculture and life sciences, experts and researchers with an ability to seek and solve problems, or individuals with rich human qualities and creativity who can be active members of both the local and international community. Students are selected based on the combined results of the standardized national examination for university admission, an individual academic skills test, and a review of reports. By requiring an individual academic skills test, the Faculty seeks to select students demonstrating exceptional overall academic performance. The cumulative results of short essays, interviews, letters of recommendation, and reports are considered for the selection of students demonstrating fundamental academic skills. 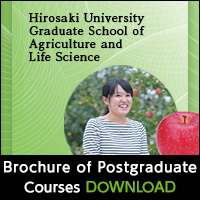 By understanding fundamental life phenomena, biodiversity, adaptive strategy, mechanisms of evolution, and ecology and environmental sciences, as well as by conducting fieldwork in the abundant nature of Aomori prefecture—including the World Heritage site Shirakami mountain range—students foster abilities that may develop from fundamental biology to specialized fields. As such, they will be able to contribute to the understanding of fundamental biological phenomena and the development of biological sciences, while possessing a dynamic and composite understanding of bio-ecology and a practical, relevant perspective of the conservation of the natural environment. Using the latest in biotechnologies, and by applying related academic fields including physical chemistry and information science, students at the Department of Biochemistry and Molecular Biology understand various life phenomena at a cellular, molecular, and substance level. By studying micro-organisms and enzymes from biochemical and molecular biological perspectives, and by working with the latest biotechnologies such as genetic engineering and glycotechnology, students are able to apply the latent potential of organisms and contribute to the use and development of next-generation resources such as the biomass. The Department of Applied Biosciences aims to develop individuals who can lead the food products industry through rich knowledge and expertise in plant breeding biotechnology, breeding of next-generation varieties based on plant genomes, environment-friendly food production and food science, food nutrition science, basics in food product function and safety, or food hygiene. The Department is also designed to develop individuals with the capabilities to improve or develop biological functions through understanding biodiversity conservation, or work with environmental issues in conservation agriculture such as the development of new pest management technology. An understanding of general science and fundamental knowledge of biology and chemistry are required. Students at the Department of Agriculture and Horticulture grasp social and economic issues in food and agricultural production ranging from issues in fruit science, localized study, to crop science, olericultural science, ornamental science, livestock science, and production machinery science in a multifaceted, comprehensive, and practical way. Along the way, students also acquire practical knowledge and capabilities for agricultural management that seeks efficient production and improved distribution mechanisms for agricultural and livestock products. In particular, fundamental knowledge across all science subjects is required. Along with studying for regular subjects, general interest in modern agriculture and food, and general knowledge on these matters is encouraged. Students acquire knowledge and skills related to diverse fields ranging from agricultural engineering and planning to ecosystem and social systems, enabling them to have comprehensive knowledge on rural environment maintenance and conservation. Students also acquire specialized knowledge on water, soil, and agricultural facilities and related knowledge on systems and planning to develop an engineer with social responsibility awareness and an ability to contribute to local development. Demonstration of basic academic skills across all high school subjects, and willingness to study mathematics and science subjects in particular, are required.